A super entry of 320 calves and weanlings on Thursday, April 4 met a flying trade for all types on offer. A Hegarty, Bendooragh, Charolais £385, Limousin £255, Charolais £230; R and D Irwin, Dervock, Belgian Blue £355, Aberdeen Angus £335, £310, Belgian Blue £290, £230; N McNaugher, Aghadowey, Belgian Blue £350; R Logan, Rasharkin, Aberdeen Angus £345; R Orr, Ballymena, Belgian Blue £325; W Campbell, Magherafelt, Montbeliarde £310; D J Montgomery, Glarryford, Belgian Blue £300; R and P McMaster, Ballyronan, Aberdeen Angus £280, £260; A Faith, Limavady, Limousin £270; T and D Cameron, Coleraine, Aberdeen Angus £260, Simmental £235, Aberdeen Angus £200; W Lyons, Ballymoney, Aberdeen Angus £260, Belgian Blue £220, Limousin £215; W Campbell, Ballymoney, Belgian Blue £255; N Allen, Ballymena, Aberdeen Angus £250, Simmental £200; A and S Hall, Macosquin, Aberdeen Angus £240, Limousin £235, £225, £222; D McAtamney, Portglenone, Aberdeen Angus £240, Hereford £222; I Smyth, Castlerock, Aberdeen Angus £238; T Brown, Knockloughrim, Limousin £232; Irwins Drumcroone, Blackhill, Her £228; H C and J A Campbell, Ballymoney, Hereford £222, £215, £210; I Buchanan, Dungiven, Hereford £220, £215; G and E M Pollock, Ballymoney, Montbeliarde £215; W Cochrane, Macosquin, Hereford £210; A Hemphill, Armoy, Belgian Blue £205 and Magherafelt farmer, Aberdeen Angus £200. 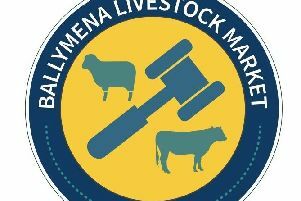 Magherafelt farmer, Belted Galloway £380, £320; A Faith, Limavady, Limousin £300, £250; R and D Irwin, Dervock, Aberdeen Angus £300, £260, £240; C Forde, Ballyclare, Simmental £290; R and P McMaster, Ballyronan, Aberdeen Angus £280; N McNaugher, Aghadowey, Belgian Blue £270; N and C Smyth, Glenwherry, Simmental £260; W Henderson, Tobermore, Belgian Blue £250; A Hemphill, Armoy, Belgian Blue £245; D Montgomery, Glarryford, Aberdeen Angus £230, £225; W Cochrane, Macosquin, Holstein £210; T and D Cameron, Coleraine, Aberdeen Angus £200 and W Campbell, Ballymoney, Belgian Blue £200. Good young calves to £175. 120 on offer with more required to satisfy demand. A good entry of 650 on Monday, April 8 met a sharper trade. Lambs to £110.70 to 488 per kg. H Dunlop, Magherafelt, 20k, £97.50 (488); F Hogg, Kilrea, 20.5k, £100 (488); P Brolly, Limavady, 21.5k, £104.50 (486); D Kerr, Portglenone, 17.5k, £85 (486), 21k, £99 (471); G Fleming, Magherafelt, 21.5k, £102.50 (477); S and S Houston, Maghera, 19k, £90.50 (476); D McKibbin, Aghadowey, 22.5k, £105 (467); T Wright, Ballymoney, 23k, £104.80 (456), 21k (2 (438); G R Wallace, Kilrea, 21k, £95 (452); M McKillop, Loughgiel, 22k, £97.50 (443); M Andrews, Garvagh, 23.5k, £103.50 (440);D McIlroy, Aghadowey, 18k, £78 (433) and C McAweaney, Cookstown, 23.5k, £101 (430). A small entry of dairy stock on Tuesday, April 9 met a super trade to a top of £1,910 for a calved heifer. W Campbell, Coleraine, third calver to £1,910, calved heifer £1,810 and H C and J A Campbell, Ballymoney, third calver to £1,680. A good entry of 280 stock on Wednesday, April 10 at Kilrea met a sharper trade with quality stores in demand. Steers sold to £1,400, heifers sold to £1,360 and fat cows sold to £1,150. H Savage, Magherafelt, 530k Belgian Blue £830 (157), 740k Aberdeen Angus £1,150 (155), 660k Hereford £875 (133), 730k Simmental £900 (123); W Campbell, Garryduff, 510k Belgian Blue £780 (153); J and I Jamison, Coleraine, 600k Holstein £850 (142), 600k, £805 (134); J and P McAuley, Ballymoney, 670k Charolais £950 (142), 680k Simmental £920 (135), 630k, £840 (133); Toomebridge farmer, 730k Limousin £1,020 (140); N Royle, Kilrea, 670k Charolais £930 (139); Toomebridge farmer, 800k Aberdeen Angus £1,080 (135); Antrim farmer, 560k Hereford £700 (125); Ballycastle farmer, 570k Limousin £695 (122), 720k Charolais £845 (117), 560k Aberdeen Angus £655 (117); Ballymoney farmer, 720k Limousin £865 (120); W Moore, Macosquin, 710k Limousin £800 (113); C Mooney, Rasharkin, 700k Friesian £780 (111) and T T and IG Kyle, Portglenone, 580k Friesian £635 (110), 480k Montbeliarde £520 (108). Limavady farmer, Charolais heifer with Simmental heifer calf at foot to £1,680. Heifers: S J Wilson, Dungiven, 380k Limousin £855 (225), 400k, £865 (216), 400k Charolais £865 (216), 470k Limousin £1,000 (213), 355k, £750 (211), 400k Charolais £840 (210), 410k Limousin £850 (207), 310k, £615 (198); J Higgins, Ringsend, 440k Charolais £965 (219), 460k, £990 (215); Kilrea farmer, 420k Charolais £920 (219), 310k Aberdeen Angus £660 (213), 360k Simmental £760 (211), 380k Charolais £770 (203); J Clements, Ballyronan, 480k Limousin £1,040 (217), 520k, £1,070 (206), 520k, £1060 (204); G R Wallace, Kilrea, 230k Charolais £500 (217); D Thompson, Dungiven, 580k Charolais £1,245 (215); L Blair, Limavady, 520k Charolais £1,100 (212); C Mooney, Rasharkin, 360k Limousin £760 (211); T Bates and Son, Magherafelt, 510k Charolais £1065 (209), 410k Aberdeen Angus £800 (195); J Lennox, Castledawson, 570k Limousin £1,190 (209), 610k Blonde d’Aquitaine £1255 (206), 580k Limousin £1,175 (203), 620k Blonde d’Aquitaine £1,250 (202), 680k Aberdeen Angus £1,360 (200), 660k Charolais £1,295 (196); S McLoughlin, Limavady, 600k Charolais £1,250 (208), 480k, £980 (204); A McNeilly, Toomebridge, 300k Limousin £620 (207), 320k, £635 (198); J Kelso, Upperlands, 470k Limousin £965 (205), 450k, £900 (200); R McCaw, Ballycastle, 480k Limousin £970 (202), 370k Charolais £745 (201), 350k Charolais £695 (199) and Ballymena farmer, 440k Simmental £885 (201), 460k, £900 (196). Steers: J Higgins, Garvagh, 260k Limousin £720 (277), 290k, £700 (241); R Cole, Macosquin, 370k Charolais £990 (268), 330k, £870 (264), 340k, £860 (253), 360k, £885 (246), 360k, £880 (244), 410k, £960 (234), 375k Aberdeen Angus £870 (232); Kilrea farmer, 350k Charolais £870 (249), 420k, £1,000 (238), 390k, £910 (233), 400k, £925 (231), 400k, £850 (213); R McCaw, Ballycastle, 340k Charolais £800 (235), 370k, £855 (231), 400k, £870 (218); C McQuitty, Clough, 330k Limousin £770 (233); S J Wilson, Dungiven, 370k Limousin £855 (231); F McClure, Garvagh, 260k Aberdeen Angus £595 (229), 280k, £620 (221); A McNeilly, Toomebridge, 310k Limousin £705 (227); G R Wallace, Kilrea, 290k Charolais £650 (224); A Lindsay, Coleraine, 490k Limousin £1,080 (220), 530k Charolais £1,120 (211), 600k Limousin £1,230 (205), 590k, £1,200 (203), 590k, £1,190 (202), 580k, £1,160 (200); J Higgins, Ringsend, 480k Charolais £1,020 (213), 480k Limousin £1,000 (208); L Blair, Limavady, 560k Charolais £1,160 (207); S McDonnell, Glenariff, 420k Simmental £870 (207), 460k Simmental £950 (207), 430k, £870 (202); S McLoughlin, Limavady, 620k Charolais £1,270 (205); Kilrea farmer, 650k Limousin £1,335 (205), 690k Belgian Blue £1,350 (196); Coagh farmer, 320k Aberdeen Angus £645 (202); S McCann, Portglenone, 540k Limousin £1,090 (202), 540k Hereford £1080 (200), 550k Aberdeen Angus £1090 (198), 550k Limousin £1,070 (195) and H and J Paul, Maghera, 590k Limousin £1,160 (197).